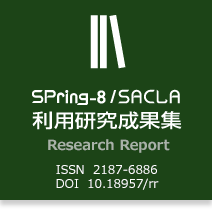 What is SPring-8/SACLA Research Report? We have studied the magnetic and orbital orderings in Cu 3d orbitals of KCuF3 by using Cu K-edge resonant X-ray scattering. For the orbital reflection (1 0 5) at quadrupole transition, however, no cleartransition was observed about 40 K. This shows that the coupling between spins and orbitals in Cu 3d orbitalsis small in type-a orbital ordering of KCuF3. aGunma University, bALCARE Co., Ltd.
In-situ Residual Stress Analysis of Semiconductor Packages Comprising Thermosetting Encapsulation Resins and Copper Lead Frame under Thermal Process by X-ray Diffraction. aFDK Corporation, bFujitsu Laboratories, Ltd.